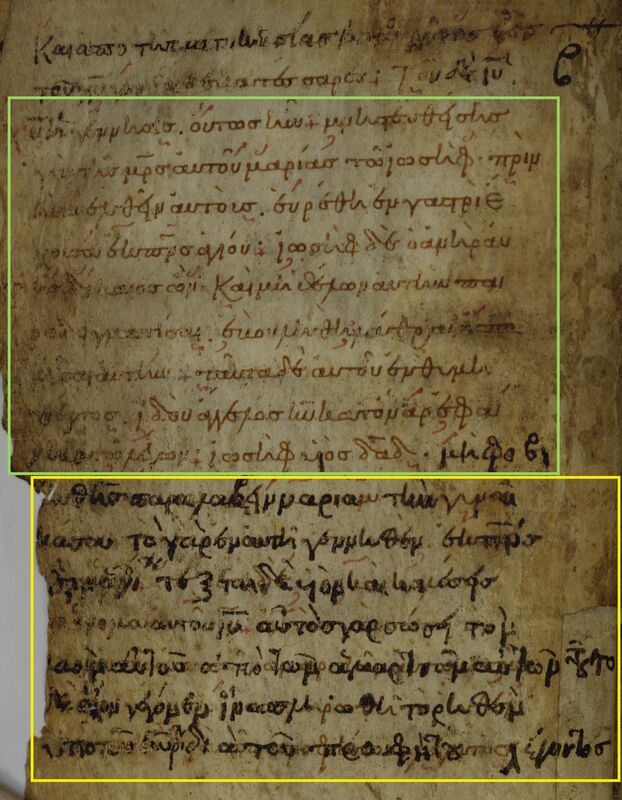 The Center for the Study of New Testament Manuscripts' (CSNTM) digital library contains hundreds of Greek NT manuscripts, each with its own story to tell. In our “From the Library” series, we will feature individual manuscripts from our collection in order to showcase their unique beauty and importance. This is part of CSNTM’s mission to make NT manuscripts accessible for everyone. If we’re honest, the genealogy is often considered the most boring part of the birth narratives in Luke. When was the last time you heard a message about that part of the Christmas story? But throughout the centuries, the Christian tradition developed unique ways of presenting this part of the biblical story—often setting it apart to make it more readable and more identifiable. In this blog we’re going to show you how some scribes copied Luke 3.23–38 and explain one example where it went terribly wrong. Of course, some manuscripts do not differentiate the genealogy from the rest of the biblical text. A manuscript we digitized at the National Library of Greece, referred to by scholars as Gregory-Aland (or GA) 780, is one example of this pattern. As you can see, there is no break in the text where the genealogy begins, and it is written in the same single column style. The text of Codex Vaticanus (GA 03, or “B”) was written in three columns, but the scribe clearly differentiated Jesus’ genealogy by listing the names in a new format. 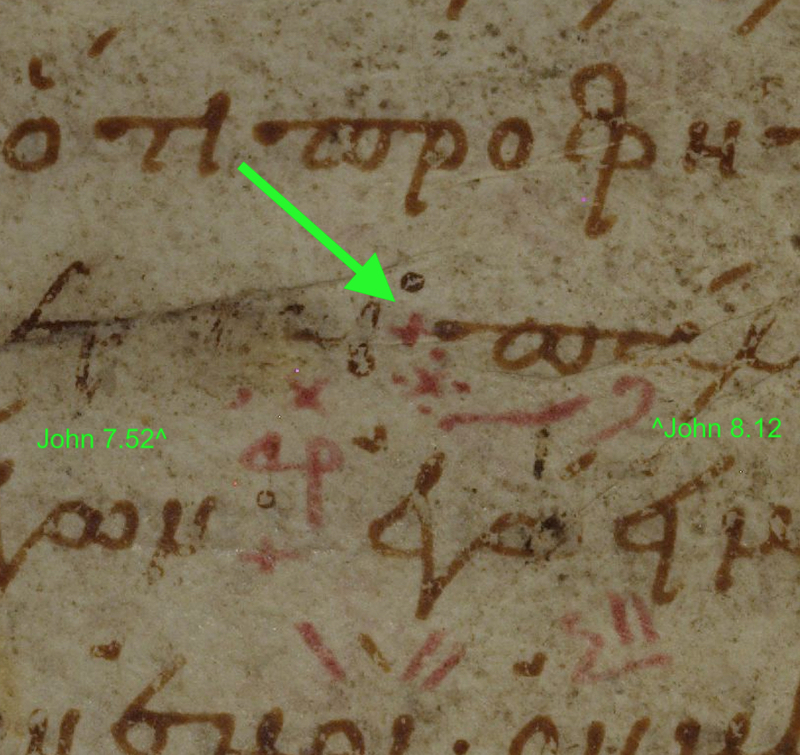 The first word, ΤΟΥ (tou) is set on the left margin, and then there is a noticeable space before each name is written. Other manuscripts break their normal pattern of copying the text by arranging Jesus’ lineage into separate columns. GA 773, also from the National Library of Greece, organizes the names into two columns. The scribe also included commentary in the margins. The scribe who copied CSNTM’s manuscript (GA 2882) wrote the Scriptures in a single column with very neat handwriting. At Luke 3.23, the scribe broke the flow of the text to copy the list of names in three columns. The names proceed from left to right with the article ΤΟΥ (tou) written with a large red tau before the name. When scribes copied Jesus’ genealogy in columns, it was perhaps intended to make the passage more prominent and easier to read. But one scribe who copied GA 109, a fourteenth century Gospels manuscript in the British Library’s collection, made an infamous mistake. The scribe completely rearranged Jesus’ genealogy. As you probably know, Luke traces Jesus’ ancestry from Joseph all the way back to Adam, concluding with “Son of Adam, Son of God.” In GA 109, the scribe wrote, “Son of Adam, Son of Aminadab, Son of God, Son of Aram”! Apparently, God was born from Aram! How did the scribe make such a serious mistake? 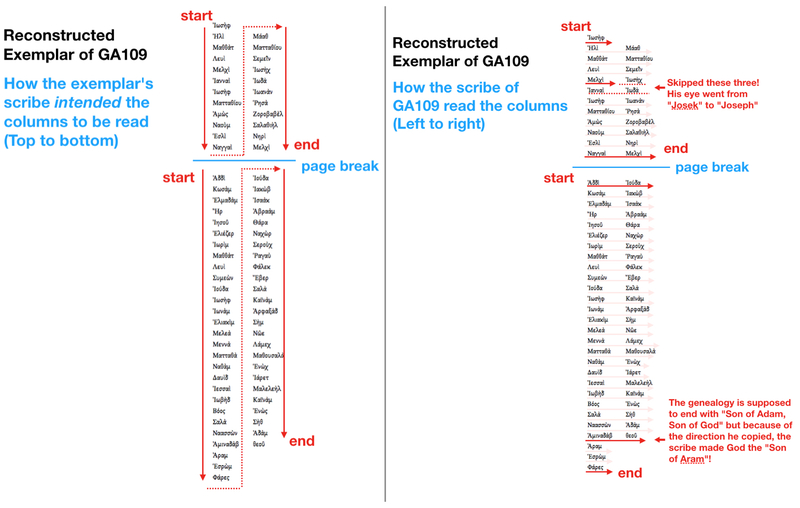 It seems the scribe’s exemplar—the manuscript from which GA 109 was copied—had Luke’s genealogy written in two columns. These should have been read going down each column completely before going back to the top of the next column. But this scribe read the columns from left to right, putting Jesus’ descendants all out of order. At one point, there are two names in the proper order: “Son of Melki, Son of Addi.” We conjecture that at this point the exemplar proceeded to a new page, so the scribe happened to get two correct in a row, but then continued to make the same mistake. Regardless of how absentmindedly the text was copied, we have to wonder whether the scribe knew Greek because “son of God” is written with a nomina sacra, which should have given enough pause to catch the mistake. Whatever the scribe’s Greek proficiency, leaving Jesus’ genealogy out of order is a serious error which was only possible because of the varied ways Luke 3.23–38 was copied in columns in some manuscripts. Though it is easy for us to gloss over the list of Jesus’ ancestors when studying the birth narratives in Matthew and Luke, the ancient and medieval scribes deliberately copied the story in ways that set it apart and drew attention to it. The various ways the Lukan genealogy was copied caused us to wonder why they took the time to write the names like this. There could be a few practical reasons. The scribes may have done this because it was easier to write the names (some of which are duplicated in the text, like Joseph in 3.23 and 3.30) without error in column form. Or it could be that they found it easier to read the names for public recitation when they were listed in columns rather than written in paragraph form. But we speculate that in their era of kings and heroes they found greater significance in the genealogy of Christ—a significance that is often missed by modern readers. Whatever the reason may be, the genealogy of Jesus in Luke 3.23–38 has a fascinating and infamous place in the textual history of the New Testament. So this year if you read the story of Christ’s birth, don’t skip over the long list of names Luke gave us. Take a moment to reflect on what a long lineage like Jesus’ would have meant to the early readers of Luke’s Gospel. * If you’re interested in looking at additional examples of how scribes copied Luke’s genealogy, there are a few easy ways to do this in our manuscript library. You could use the “Jump to Book” feature to navigate easily to the beginning of Luke in all the manuscripts we have tagged on our site. The other way would be to search “Luke 3” or “Luke 3.23-38” in the search bar of our website. This guide will explain how to use these features if you need extra help. We suggest taking a look at some of the most famous manuscripts like Codex Sinaiticus and Codex Bezae (05). You also could look at GA 800, which has commentary from church fathers surrounding the text. As the holidays approach, we want to wish you and your loved ones a happy Thanksgiving and thank you for your invaluable support this year. 2018 has been another successful year for CSNTM. Over the course of the year, we completed four significant expeditions. The year began with an expedition to the Library of Hellenic Parliament in Athens. Then in the summer we worked at the National Centre of Manuscripts in Tbilisi, the Byzantine Museum in Ioannina, and the University of Heidelberg. Altogether, we digitized seventeen of the most significant and fragile manuscripts we have ever handled, adding up to 9,159 total images. 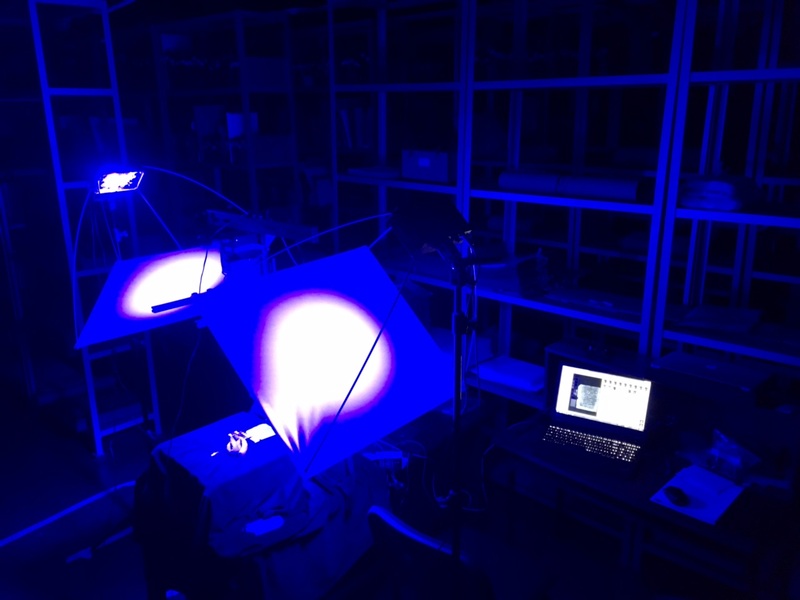 Our work this year was enhanced by our new access to multispectral imaging technology. This technology allows us to view and preserve text otherwise invisible to the naked eye. In 2018, we were able to purchase this equipment, train our staff, and use it for the first time, leading to the discovery of two manuscripts by our team this summer. All this work allows anyone to examine Greek New Testament manuscripts from anywhere in the world. So far this year, over 45,000 people have visited our website to study manuscripts or learn about digital preservation. Your faithful and generous support – shown by your involvement, gifts, and encouragement – made all of this possible. Because of your enduring partnership with us in our mission the task of preserving these important documents continues to move forward. For that we are immensely grateful. Thank you. CSNTM’s staff digitized arguably the most significant parchment manuscript we have ever handled at the National Centre of Manuscripts in the Republic of Georgia. Scholars call this famous manuscript Codex Koridethi (Gregory-Aland 038, also known as Θ [theta]). Koridethi, copied in the 9th century, contains all four Gospels written in majuscule script, which means it was written in capital letters. However, we believe the scribe may not have known Greek well because of many unnatural syllable breaks, odd letter formations, and corrections to the text. Koridethi is also an important witness for several major textual variants, such as the omission of “Son of God” in Mark 1.1 and the story of the woman caught in adultery (John 7.53–8.11). This unique manuscript raises interesting questions about our understanding of the relationships between Greek New Testament manuscripts and contains curious oddities in its physical production. Codex Koridethi is one manuscript that exemplifies the challenge and inherent problems with classifying manuscripts into text types. Studies of the Gospels in Koridethi have shown a partial alignment with different textual traditions—some parts appear to be “Alexandrian,” others “Byzantine,” and still others an idiosyncratic blend. Koridethi exposes the difficulty of fitting some manuscripts into particular categories and further highlights how much work remains to understand the transmission history of our New Testament manuscripts. Accordingly, this manuscript has consistently been identified as a significant witness to the original wording of the Gospels, and scholars producing editions of the Greek New Testament consult its readings whenever they are evaluating a textual problem in a passage it contains. From Leaf 180. Notice that the text is not only written around a pre-existing hole in the leaf, but a tear in the parchment has also been sewn back together, with the text written around it. From Leaf 151 (top left), Leaf 154 (top right), Leaf 165 (bottom left), and Leaf 212 (bottom right). In the production of parchment, as the animal skin was scraped and stretched repeatedly, it was easy to scrape a section too thin, which could result in larger and larger holes developing as the skin was stretched to its final size. It is unclear why parchment with such significant defects would have been allowed for use in a Bible, but we can make a decent guess. 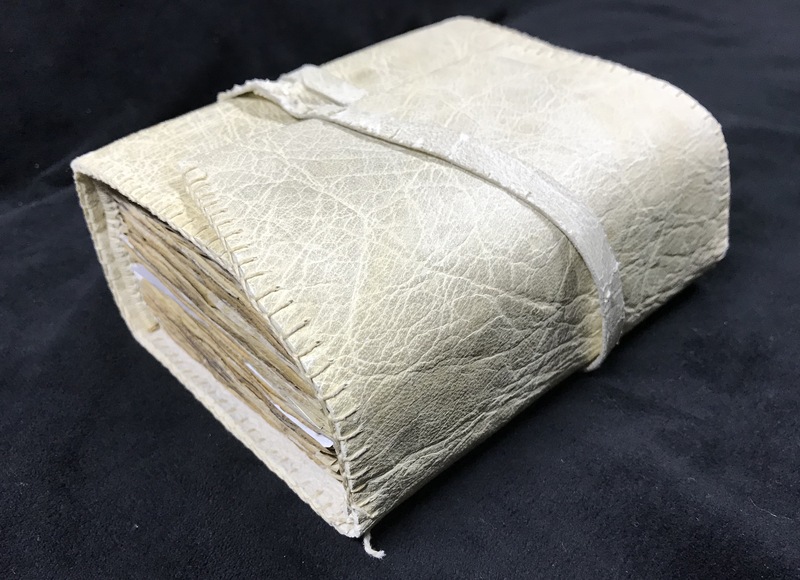 Parchment, because it is made from animal skins, was highly valuable in the medieval world, and the bill for an order the size of Koridethi would have been steep. So it is possible that whoever produced Koridethi got a bit creative here and was willing to have a few imperfections present in their codex if it meant it could contain all four Gospels. This would certainly have been preferable to undertaking again the laborious and expensive process of producing parchment. Whatever the case may be, the scribe made it work, and this small feature provides us yet another window into the world of ancient book production. Every manuscript has a story to tell. We are grateful for the privilege to digitize Codex Koridethi and share images of it freely in our digital library. The exceptional staff at the National Centre of Manuscripts are also to be thanked for conserving this codex and collaborating with CSNTM. 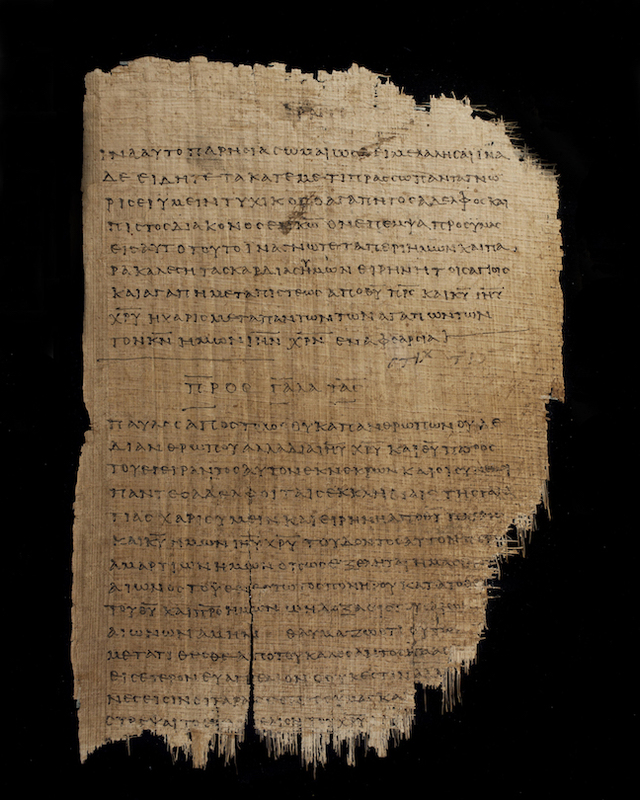 You can see all the images of this Greek New Testament here in our digital library. 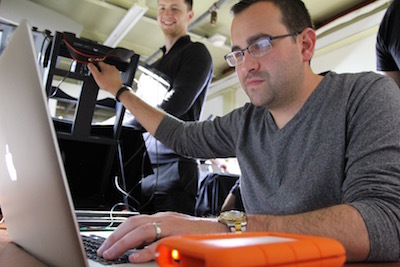 In August, CSNTM appointed Jacob W. Peterson to the newly-created position of Research Fellow. Jacob began working with us as a graduate student intern in 2011. Afterward, he joined the staff as Intern Coordinator until he left to pursue a PhD in New Testament Language, Literature, and Theology at the University of Edinburgh. While away, Jacob continued to play an integral role in the Center’s mission by participating in every digitization expedition over the last three years. Now that he is wrapping up his dissertation at Edinburgh, we are thrilled to have him back on our team where he will not only lead worldwide digitizing expeditions, but also will enhance our research agenda. Now, hear from Jacob about what he will initially do in his new role. One of CSNTM’s missional aims is “to publish on various facets of New Testament textual criticism.” Unfortunately, aside from the occasional conference presentation or journal article, we have been unable to dedicate much time or resources toward this aim. As the Center has continued to grow, both in terms of its size and reach, the time has come to highlight the impact of the work being done on the discovery and digitization side of operations. CSNTM has historically focused its efforts and resources on the discovery and digitization of manuscripts, and it has been very successful at this task. Since its founding in 2002, CSNTM has digitally preserved almost seven hundred manuscripts at locations around the world. Among these are nearly one hundred manuscripts that were previously unknown to Western scholarship. Approximately seventy of these manuscripts have been officially catalogued with the Institute for New Testament Textual Research in Münster, Germany, yet almost all of them have gone unstudied. The desire to fulfill the Center's missional aim combined with the growing number of discoveries the organization has made presented the perfect opportunity for someone to step in and begin doing in-house research. My primary responsibility over the next few years will be examining the manuscripts CSNTM has discovered for the purpose of producing several academic volumes focused on their contents. The aim of the volumes is to provide scholarly treatment of all of CSNTM's discoveries and, in this way, complete the act of manuscript discovery, digitization, and scholarly presentation. A secondary aim is the publication of volume(s) on images in CSNTM's manuscript library. 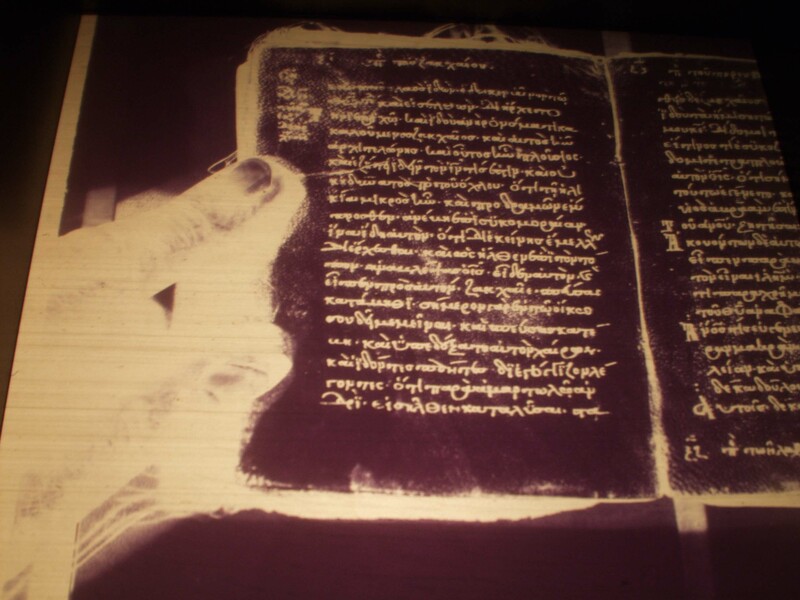 These would focus on new research on and editions of known manuscripts resulting from advanced digitization techniques (i.e., multispectral imaging) or in-depth text-critical studies of particular manuscripts. Ultimately, the hope is to increase CSNTM’s research profile, and also to collaborate with up-and-coming students and recent PhDs to give them opportunities to do original research. 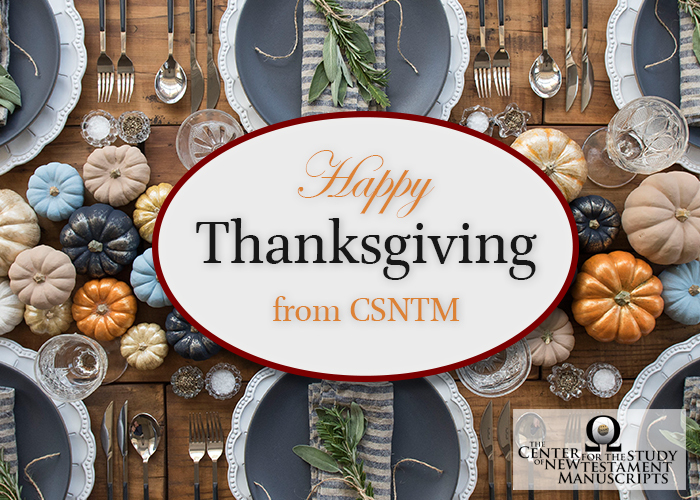 We at CSNTM, and I especially, are thankful for your continued support of everything we are doing and are grateful for the opportunity to expand the scope of our operations, which will hopefully only increase our reputation and impact. What are you excited to learn or do in your internship this year? I’m excited to learn the ways of research and what life in the academy is like. What are you excited to learn or do in your internship this year? I am excited to do original research and to learn from Dr. Wallace. What are you excited to learn or do in your internship this year? Aside from getting practice, coaching, and exposure on how to research and think critically, I’m excited to grow in my own beliefs and in how to communicate those to others. I’m looking forward to deepening an understanding of worshipping with our minds. 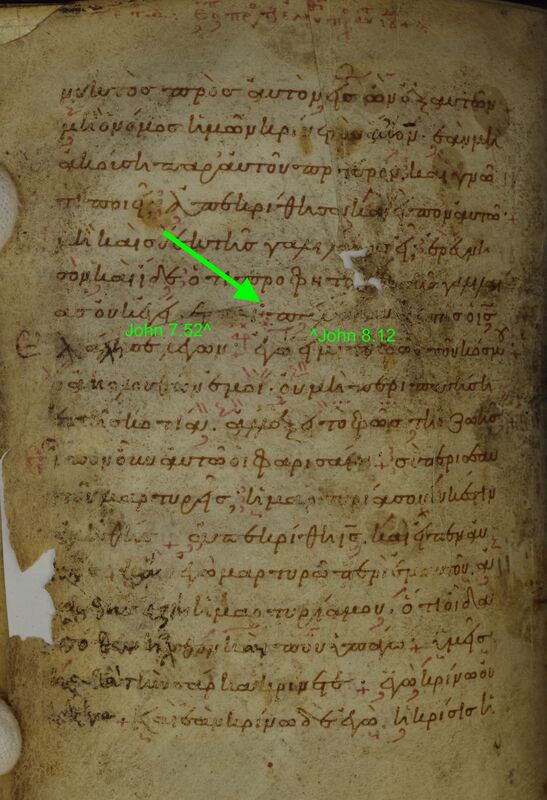 The Center for the Study of New Testament Manuscripts (CSNTM) Digital Library contains hundreds of Greek NT manuscripts, each with its own story to tell. In our “From the Library” series, we feature individual manuscripts from our collection in order to showcase their unique beauty and importance. This is part of CSNTM’s mission to make NT manuscripts accessible for everyone. The manuscript featured in this article is Gregory-Aland 804, a Gospels manuscript from the 11th century. The manuscript originally contained all four Gospels, but it is now missing the last third of the Gospel of John. We digitized GA 804 at the Library of the Hellenic Parliament during our expedition in January. As we study a manuscript, its physical features offer clues about the people who produced and used this particular copy of the New Testament. GA 804’s unique physical features help us draw conclusions about how it may have been used. Modern publishers design Bibles in a variety of formats and features to accommodate the people who will read a particular copy of the Scriptures. Some have extra room for note-taking, others are pocket-sized, and others include comments and symbols to guide interpretation. Each is produced for a particular kind of reader. This is not new. Throughout the history of the Bible, scribes and copyists devised a variety of different formats depending upon the intended use. Let’s consider the size. GA 804 is noticeably small—hardly larger than an average iPhone—and only 5.4cm deep. The scribe copied the text of all four Gospels in minute script so that it would fit the tiny proportions of this codex. You get a sense of how small this manuscript is when it’s compared to others. 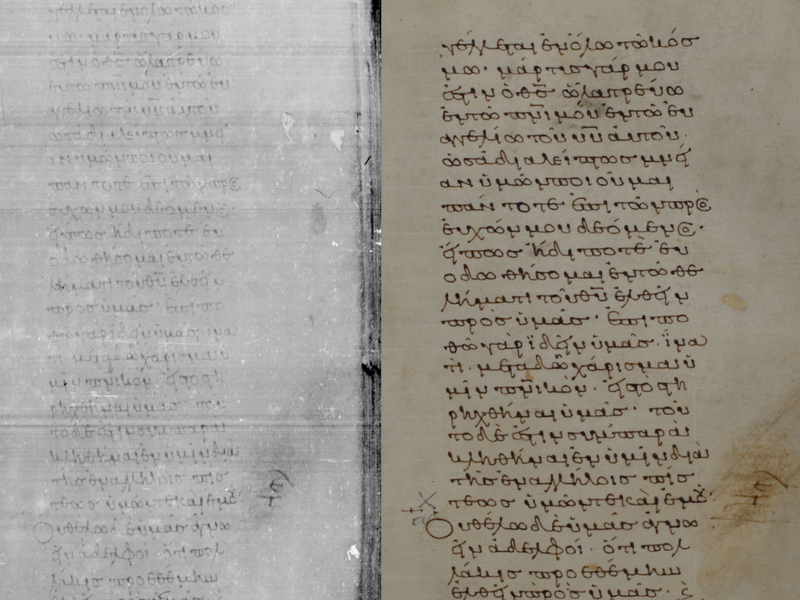 Below is a to-scale comparison of GA804 and the largest lectionary in the Hellenic Parliament’s collection. The scribe’s handwriting is another clue. GA 804 was copied with petite handwriting indicating it was probably a personal New Testament that was read privately rather than for public services like the lectionary in the above example. A codex this small designed for personal use would have been ideal for travel. Taken together, these traits indicate GA 804 is a 1,000 year-old traveler’s Bible. The liturgical and public reading of Scripture was vital in the ancient and medieval church; but, as GA 804 indicates, so was personal and reflective reading. We can scarcely imagine just how arduous and unpredictable journeys were back then. Travelers wanted to have the Gospels ready at hand as they encountered challenges and difficulties on their path to new places and cultures. The words of Christ provided guidance along the way. Every manuscript has a story to tell. We are grateful for the privilege to digitize GA 804 and share part of its story with you. The exceptional staff at the Library of the Hellenic Parliament are also to be thanked for conserving this codex and collaborating with CSNTM. You can see all the images of this Greek New Testament here in our digital library. We would like to extend a heartfelt THANK YOU to more than 200 of our friends who made a donation since we announced our $100,000 matching grant. You went above and beyond in your response. Together, you gave $198,752, nearly doubling what was needed to complete the matching grant challenge. You provided crucial support so that CSNTM could digitize manuscripts in Tbilisi, Georgia; Ioannina, Greece; and Heidelberg, Germany this summer. The manuscripts preserved include the most significant parchment manuscript CSNTM has ever digitized and one of the oldest manuscripts of Romans known to exist. And we used multispectral imaging technology that will reveal text never before seen in modern times. Soon these manuscripts will be shared online for the world to see in breathtaking high-resolution images. Your generosity will have an ongoing impact. Beyond these expeditions, we will continue to build relationships with new partners who want to see their manuscript collections preserved. We also will continue to study manuscripts in our collection so that their texts and features can impact the latest research on the New Testament. Thank you, again, for preserving ancient New Testament manuscripts for the modern world! 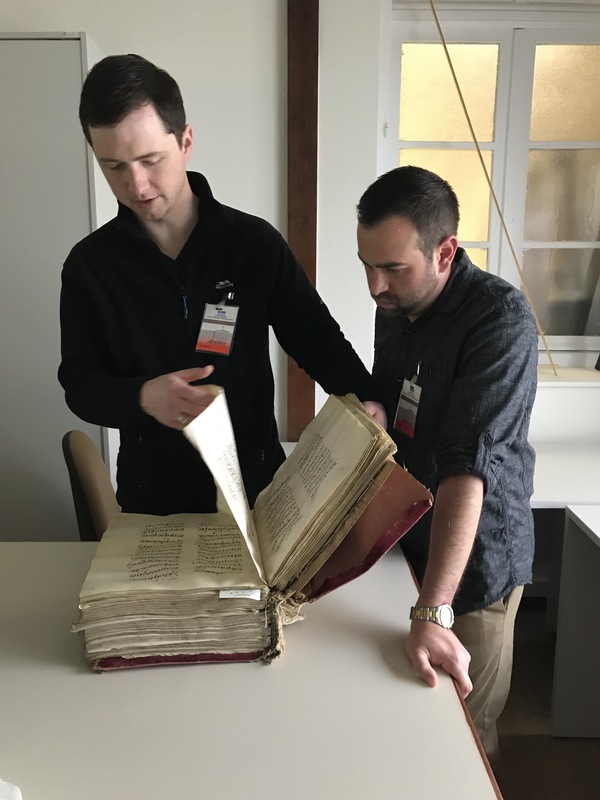 The Center for the Study of New Testament Manuscripts (CSNTM) travels every summer to visit key locations throughout the world and digitize their collections of manuscripts. This summer we digitized some of the most significant manuscripts that we have ever preserved on a whirlwind expedition to three countries! The trip began at the end of May, when Dr. Daniel B. Wallace and a team of researchers traveled to Tbilisi, Georgia to evaluate and prepare the manuscripts housed at the National Centre of Manuscripts (NCM). Working with their staff they were able to view Codex Koridethi (Θ), which is a 9th century majuscule or capital-letter copy of the Gospels. The digitization team, composed of Robert D. Marcello and Jacob W. Peterson, arrived in June and now this manuscript, which has been an extremely important witness to the text of the Gospels, will be made available for all to see in high-resolution images. The team also digitized the rest of the collection at the NCM, including Gregory-Aland 0240, which is an early palimpsest—a manuscript that had its original text scraped off and a new text written over it—containing portions of 1 Timothy and Titus. This manuscript was digitized with CSNTM's new multispectral imaging equipment, and it has allowed the under-text—which has hardly been visible for centuries—to now be easily seen. While digitizing this manuscript the team also identified a new Georgian palimpsest in the same volume! The team loved working with Director Zaza Abashidze and the staff of the National Centre of Manuscripts and greatly appreciated their willingness to have these cultural-heritage artifacts preserved for future generations. Traveling from Tbilisi, the team went to Greece to meet with some of our partners and International Advisory Board members about future projects, and to digitize a collection in the city of Ioannina, Greece. 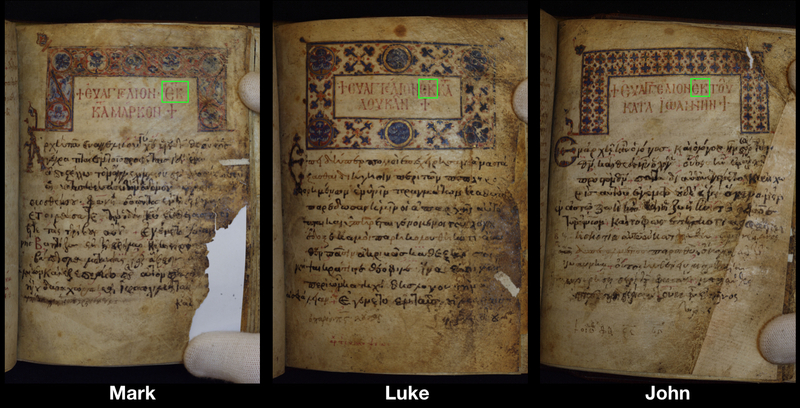 We digitized a 12th–13th century minuscule of the Gospels at the Byzantine Museum of Ioannina. This manuscript was given to the museum by a monastery and is enclosed in a stunning silver binding. We want to specifically thank Konstantinos Soueref and the Byzantine Museum’s staff for their hospitality and allowing this treasure to be preserved. For the final leg of our summer expeditions, the CSNTM team traveled to Heidelberg, Germany to digitize the New Testament papyri found at the University. These manuscripts, which are some of the earliest witnesses to the text of the New Testament, were in need of special digitization, since some of the text has been difficult to decipher. 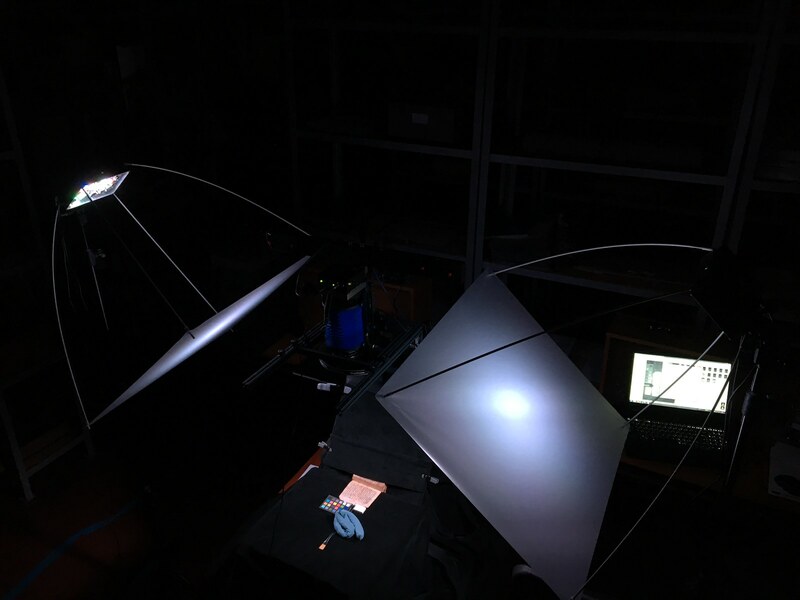 Dr. Wallace prepared the manuscripts noting their key features, and Jacob and Rob digitized them with our new multispectral imaging equipment. After image processing is complete, these manuscripts will be made freely available to all on our website. We must also thank Professor Dr. Andrea Jördens and the staff at the University of Heidelberg’s library for their generous hospitality and willingness to allow us to preserve these manuscripts with multispectral imaging. This summer we completed expeditions in three countries. We digitized some of the earliest and most significant witnesses to the text of the New Testament. In so doing, we are continuing to fulfill our mission of making these manuscripts free for all and free for all time. Summer Expeditions and a Matching Grant! One of the busiest times for CSNTM is the summer. It is during these months that we begin our expedition schedule and travel to places around the world to preserve manuscripts for future generations. This summer is jam-packed with some very significant expeditions. In fact, this summer teams from CSNTM will be working at seven sites in four different countries! As with every trip, due to security reasons, we are not able to announce where we are traveling. However, we can’t wait to share with you about some of these exciting opportunities. What we can say now is that we will be visiting two countries for the first time, and digitizing some exceptionally rare manuscripts—utilizing our new MSI technology! This technology will allow us to see texts that have been hidden for centuries. As always the images will be freely posted on our website for all to see. We also plan on establishing some new collaborations and securing additional sites for future work. So many places are opening their doors to CSNTM. In fact, right now we have a larger demand than we can even meet in one summer. This is an amazing problem to have. Funds are needed now to fulfill these expeditions. We just received news of a $100,000 matching grant! We are asking you to consider supporting these exciting opportunities. That $100,000 could soon become $200,000, allowing us to continue our mission of preserving ancient Scripture for the modern world. The manuscript now known to New Testament scholars as Gregory-Aland 2907 was ‘discovered’ by CSNTM almost a decade ago. The Center became aware of this manuscript through a route full of intrigue. A friend of the Center—whom we have never met—was on the lookout in his country for uncatalogued New Testament manuscripts. After some super-sleuthing, he was able to locate the owner, a private collector, and he put them in contact with the Center. CSNTM then partnered with the owner to digitize the manuscript and make the images available online. This was highly significant, since GA 2907 is a first-millennium witness to the text of the Gospels, and its witness is only now being taken into account by scholars. From the work of Darrell Post, who did a collation of the entire codex, we have learned that the text of GA 2907 very closely resembles the Majority Text. According to Post, the original scribe was careful and “committed very few unforced errors in the copying of this manuscript.” The original scribe wrote “very neatly” and was even neat in correcting the text, leaving little or no trace of the mistakes in places where the text has been scrubbed and rewritten. In contrast to the scrupulous work done by the original scribe, the extensive repairs and ‘corrections’ of a later scribe appear clumsy and at times even bizarre. As Post notes, the later corrector’s attempts to retrace over the original scribe’s writing often did “more harm than good.” The corrector “sometimes left alone faded brown letters, and at other times traced over perfectly legible letters.” This is reminiscent of what a later copyist did to the text of Codex Vaticanus, although 2907’s ‘corrector’ was not in the same league as Vaticanus’s corrector. A good example of such corrections comes towards the very beginning of the manuscript in Matthew 1. You can see the original scribe’s writing in the top half of the page. Then the later scribe’s retracing begins in dark black ink on the bottom half. The retracing skips some letters and does not trace well over others, ignoring the form of the letters in some cases. Here is another example from a few leaves later at the end of Matthew 2 and beginning of chapter 3. In the fourth line from the bottom, you can even see an instance where the corrector’s re-written line completely departs from the original scribe’s. The reasons for the corrector’s sloppy work are unknown, but they illustrate the fascinating and complicated histories that manuscripts can have. GA 2907 was obviously well worn from centuries of use, with someone even going through the trouble of trying to make the manuscript usable again after the original work had become damaged and faded. An idiosyncratic feature of GA 2907 is the title given to each Gospel. In the three extant titles by the original hand, shown above, the scribe includes an extra preposition within the traditional formulation. Typically, the title is written: “The Gospel According to Mark.” But in 2907, the scribe wrote “The Gospel From the According to Mark,” adding the Greek preposition ek, or “from,” to the title. This way of writing the title would have been typical of a lectionary, where the manuscript contains selections from a Gospel rather than the entire text of a Gospel. It seems likely that this scribe inadvertently used lectionary titles here out of habit, perhaps because the scribe usually copied lectionaries rather than minuscules. Another idiosyncrasy of GA 2907 is how the manuscript deals with the pericope adulterae, the story of the woman caught in adultery (John 7.53–8.11). The text of GA 2907 follows a well-known group of manuscripts, referred to as “family 13.” This family of closely related manuscripts places the pericope adulterae in an odd place—towards the end of Luke rather than in John’s Gospel. GA 2907, however, appears to differ from its close relatives in some interesting ways. Instead of inserting the material from John after Luke 21.38, GA 2907 inserts the material just after Luke 23.33. The material inserted is from John 7–8, but curiously the pericope adulterae itself is not included. Instead, the manuscript’s original hand moves directly from John 7.52 to 8.12 without any break. There is writing in red ink just between these two verses that could indicate that something is missing, but it is unclear. So although the manuscript has a type of text which we would expect to contain the story, instead it is missing entirely. A close-up of the transition between John 7.52 and 8.12. GA 2907 illustrates how CSNTM is contributing to scholarly work on the Greek NT. During the last 15 years, we have discovered scores of manuscripts which were previously unknown and uncatalogued. This came about through our collaborations with manuscript owners to make their collections available freely on our website, which then allows the manuscripts to be consulted by the editors of critical editions of the Greek NT. GA 2907, now less than a decade after CSNTM discovered it, was cited as one of the manuscripts consulted in a recently published critical edition, The Greek New Testament, Produced at Tyndale House, Cambridge(THGNT). THGNTand critical editions like it are the base texts used for Bible translators, whose work will soon be in the hands of readers worldwide. It is important to remember that even today, there are still manuscripts that lie undiscovered and their treasures unexplored. We want to find them. We hope that you will partner with us to discover the undiscovered in order to make it available for all. Today we are releasing images of the nine New Testament manuscripts held by the Hellenic Parliament Library in Athens, Greece. CSNTM partnered with HPL’s excellent library staff to complete this project earlier in 2018. You can read about it here. As mentioned in our initial blog about the expedition, one feature of the HPL collection that we found most interesting was the wide variation in size among the manuscripts. GA Lect 450 was one of the largest manuscripts CSNTM has ever digitized, whereas GA 804 was nearly the smallest. To put it in perspective, a leaf of GA Lect 450 has nearly eight times the surface area of GA 804 (GA 804 is roughly the height and width of an iPhone). These variations among NT manuscripts occur due to the different purposes for which they were intended. GA Lect 450 was obviously intended to be read out loud to a church gathering as part of the liturgy, and therefore its large writing made for easy reading. On the other hand, it seems GA 804 was intended to be a hand edition of the Gospels, perfect for personal use and constant access. We hope you will enjoy exploring this collection. You can find links to each of the manuscripts below. 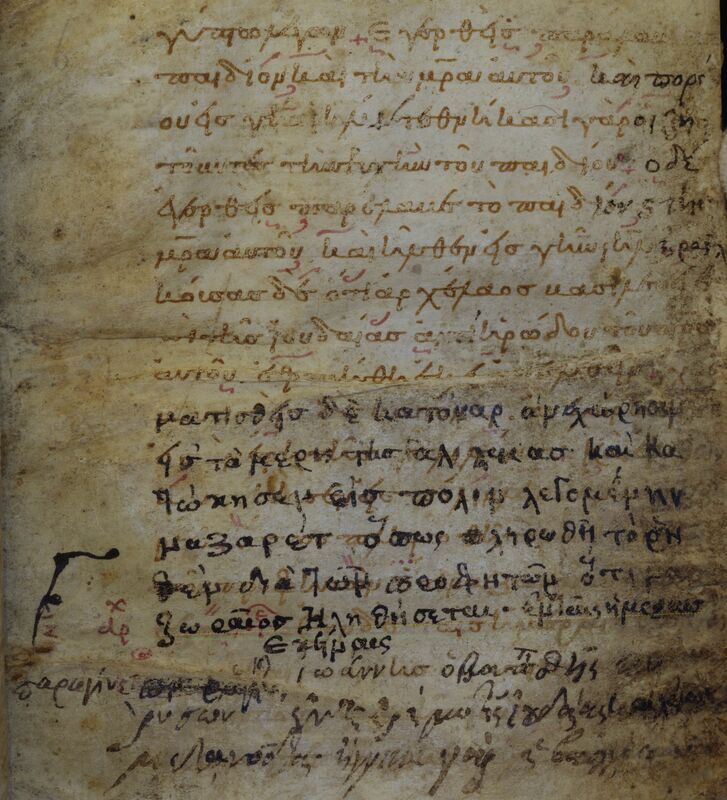 In January, nine Greek New Testament manuscripts owned by the Library of the Hellenic Parliament in Athens, Greece were digitized by the Center for the Study of New Testament Manuscripts. The Library of the Hellenic Parliament is prominently located in the center of Athens at the Old Royal Palace which is now Greece’s Parliament building. It is a historic and beautiful site. Travelling to Athens feels like taking a long journey home. Yet, even after spending months working at museums and libraries in Athens, it is still a joyous experience to examine and digitize Greek New Testament manuscripts in such a historic city. The concept for our digitization project at the Library of the Hellenic Parliament was developed during the summer of 2017 when Dr. Daniel B. Wallace, CSNTM’s Executive Director, met Dr. Eleni Droulia, the head of the library’s collection, and examined their manuscripts with Dr. Samuel Lamerson, president of Knox Seminary. This visit was instrumental for our agreement to partner with one another to digitize their nine Greek New Testament manuscripts. In December, Dr. Wallace returned to prepare the manuscripts for digitization. In only three days he combed through more than 4,000 leaves and recorded essential information for the digitization team and metadata that will be useful for future studies on the manuscripts. 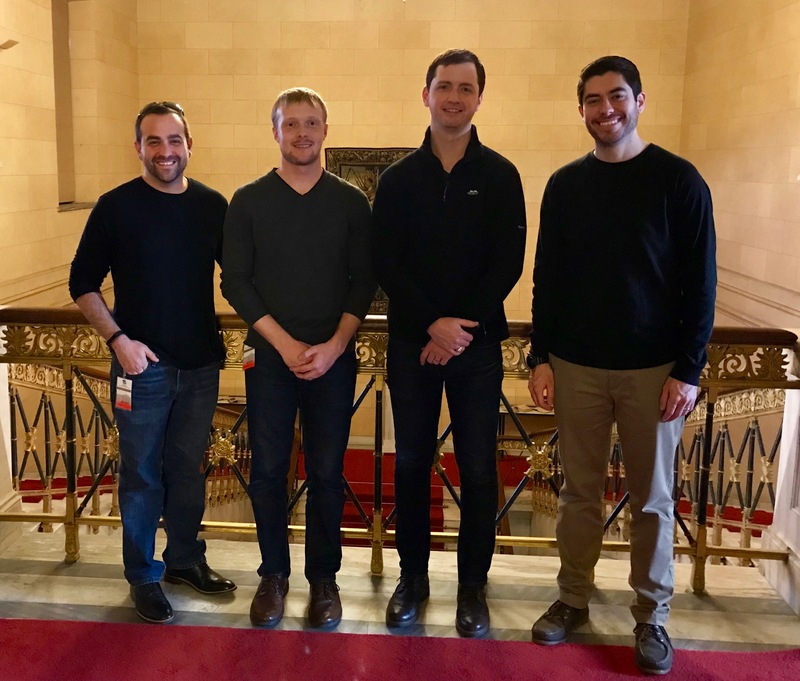 At the beginning of January, our digitization team traveled to Athens, led by CSNTM’s Director of Operations and Research, Robert D. Marcello. The other team members were Jacob W. Peterson, Andrew K. Bobo, and Andrew J. Patton. The team worked with precision and efficiency, completing the digitization work ahead of schedule. One of the most interesting features about Parliament’s collection was the wide range of sizes for their manuscripts. Lectionary 450 is an enormous manuscript: 35 cm by 28 cm, written in gigantic script on 478 leaves! On the other hand, codex 804 was especially small; its height was that of an iPhone with petite handwriting on 262 leaves. We greatly enjoyed working with the staff at the Library of the Hellenic Parliament, including Dr. Eleni Droulia and Mrs. Angela Karapanou. They were gracious hosts for us. Their leadership expedited our digitization project and has contributed to the excellent condition of the library’s special collections. We were honored to collaborate with their staff and look forward to continued partnership. Two other groups of people deserve special thanks for their invaluable support. First, we are grateful for our partners at the National Library of Greece who introduced CSNTM to the staff at the Parliamentary Library and collaborated on the project with us. Second, CSNTM could not have completed this project apart from the generosity of you, our donors, who believe as we do that it is critical to preserve handwritten copies of the Greek New Testament and share the images freely online. Thank you for contributing to this digitization project! We would also ask you to show your support for the Parliament Library by liking them on Facebook here. The following manuscripts were digitized and will be available to study online in the coming months. In the beginning there was microfilm. And it was not good. The finer points of the text could not be read, the colors were rendered in various shades of gray, and marginal notes and commentaries were seen as lines and bumps. Erased text and corrections were undetectable, and dating the manuscripts was made more difficult because certain paleographical clues were invisible. A large percentage of the microfilm images were completely illegible. But this was all that NT scholars had to work with. And hundreds of manuscripts have never been microfilmed at all, quite a few of which were completely unknown to biblical scholars. Of these, CSNTM has already digitized nearly 100 previously unknown manuscripts. Then came digital photography. And it was very good. The Center for the Study of New Testament Manuscripts was founded in 2002. Our first digitization project was in Münster, Germany, at the Institute for New Testament Textual Research (INTF). We shot the NT manuscripts owned by the institute. These were the first NT manuscripts to be digitized, and it was appropriate that INTF was the place to launch our work. Our four and five megapixel cameras (state of the art at the time)—produced significantly better images than the microfilm. The shutter click to computer upload took 90 seconds. The whole job took several weeks. In the following years, digital cameras continued to improve. 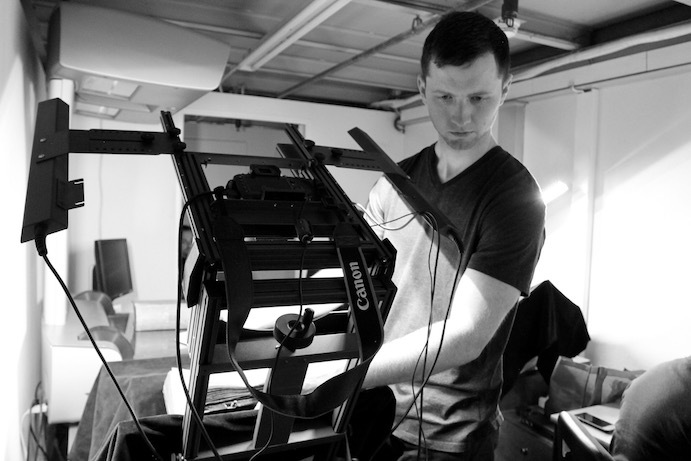 Today, we use 50 MP cameras that produce 300 MB images in TIFF. From shutter to camera is virtually instantaneous. The finest details on any given page can be blown up many times. The colors, marginal notes, even much erased text, can now be seen with ease. And posting these images on www.csntm.org, making them free for all and free for all time, gives scholars accessibility to these manuscripts at the click of a button. One of the most significant values of digitizing these manuscripts is that an exquisite image of every page is preserved for ages to come. Every library where we digitize these documents gets a complete archival copy of each handwritten treasure. And the images can be enlarged multiple times without any pixilation. Even the finer hues—which often have interpretive significance—are clearly visible. The tiniest detail no longer hides from the scholar’s sight; the former blurs are now conspicuous letters. So, why do we do what we do? CSNTM digitizes manuscripts for preservation, accessibility, clarity, recovery, and discovery. Ultimately, these images help scholars to produce Greek New Testaments that, in turn, are translated into modern languages. These priceless, one-of-a-kind codices, long obscured by microfilm, are coming to brilliant light, bringing glory to the libraries that own them and informing the New Testament text that you read today.